This portfolio page shows a series of Nissan illustrations and artwork for the 240Z 300Z, 350Z, Altima, Maxima, Pathfinder, Quest sedans, coupes and SUVs which were used in brochures and national ads appearing in several national automotive magazines and publications as well as dealership consumer brochures. 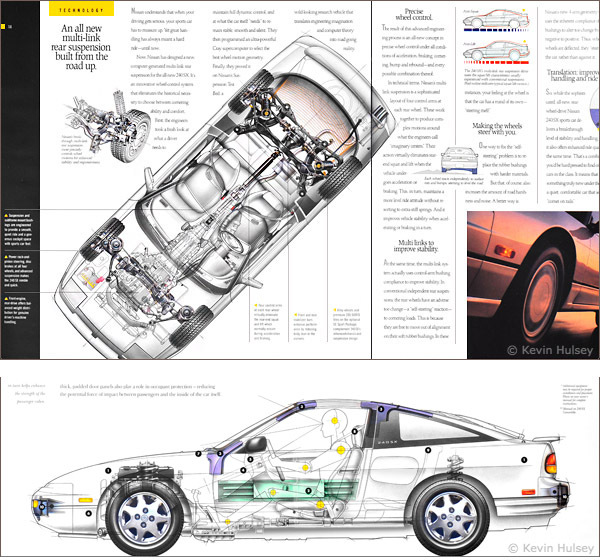 The portfolio sample above appeared in a 1990 issue of Automobile magazine using a velum overlay insert over a photographic spread. The next two images were from a series of fly-sheet velum overlays that appeared in the 1990 and 1991 Nissan 300Z brochures and was also used in national ads which appeared in Road and Track and Automobile magazine. The image reprint above is from the Nissan 300Z brochure and shows a velum overlay over aerial photography (right page) with the sportscar's chassis and driveline rendered in the line-and-tone illustration style. This velum overlay shows the sportscar's suspension which is rendered in line-and-tone over an action photograph of the car skidding on a wet track. 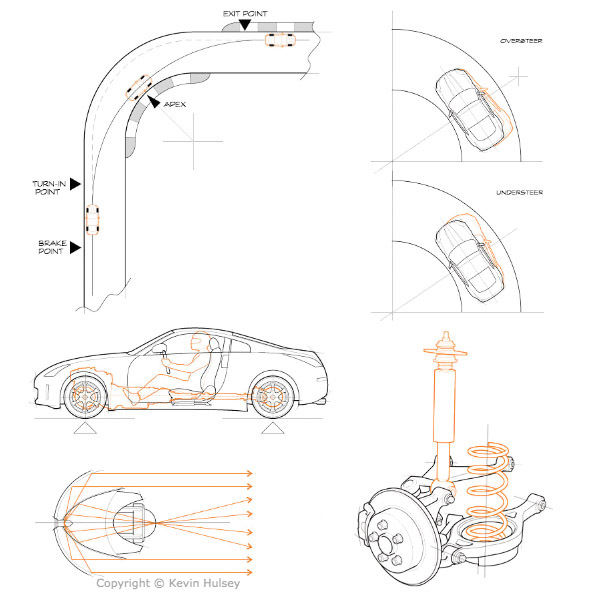 This next image above shows a series of 2-color line drawings that were done for the Nissan 350Z, showing ABS braking, independent multi-link rear suspension, passenger ergonomics and oversteer and understeer steering characteristics. This next image above shows a series of technical line drawings that were done for the Nissan 240SX brochure, showing the car's driveline and independent multi-link suspension system with smaller illustrations of handling characteristics. 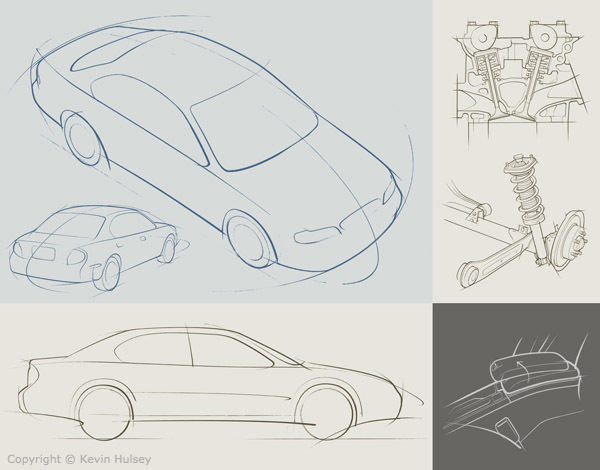 The next image above shows a series of concept line drawings that were done for the Nissan Maxima. This image of a Nissan Sentra profile cutaway shows the unibody steel structure sectioned along with the engine and suspension. 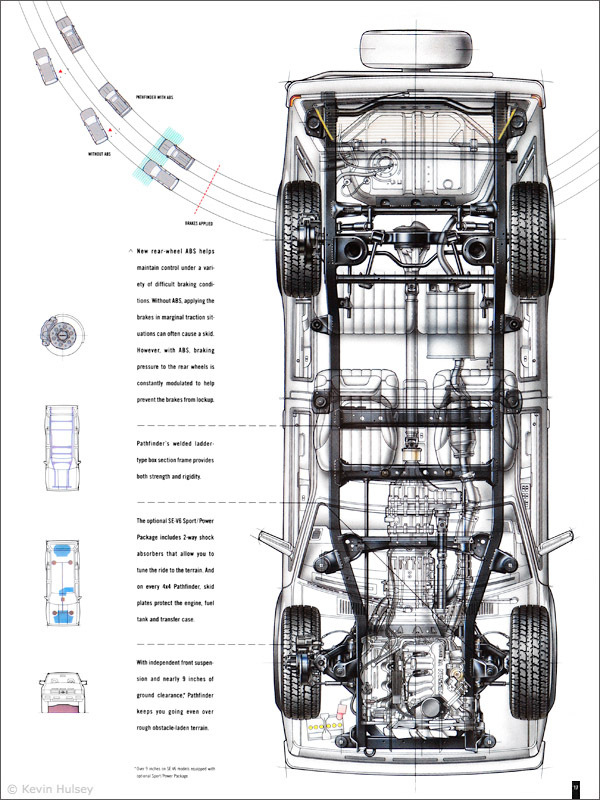 This reprint was from the Nissan Pathfinder brochure showing a top view cutaway of the vehicle's driveline and interior as well as various spot illustrations. This top-view cutaway shows a Nissan Sentra with the engine, driveline and suspension ghosted through a faded line-and-tone body. This 1980s GTP ZX-T racecar was done by my apprentice and associate, J. Hatch.